Chakra Jewelry, Handcrafted with Natural Gemstones~One of a Kind, Chakra pendants are one-of-a-kind, hand beaded, using Natural Gemstones. Chakra pendants are very versatile, and can be attached to anything you wish - even your favorite necklace, transforming it into a "Y" design necklace. You may want to attach your Chakra Pendant to a chain, hair extension, or wear as an earring. Balance energy in your bedroom by hanging your Chakra Pendant in the window to reflect the rainbows from the sun, or next to your bedside to align your energy while you sleep. Use your imagination!! In keeping with the healing properties of the gemstones, I use Natural gemstones which correspond with each of the 7 major chakras, combining them with the properties & color to aid in balancing the body’s chakra system . This Beautiful Pendant is made with a SWAROVSKI CRYSTAL drop, and smaller crystals in between each gemstone. I will add more information on swarovski crystal. It is the finest man made crystal you can buy. Most pendants measure approximately, from 4.25" to 5.50" in length unless otherwise specified. All closures are made of Sterling Silver, or 14k Gold if specified. Beautiful handmade pendants that have amazing balancing energy. The gemstones on this pendant are as follows, AAA Grade Quartz, A Grade Amethyst, Lapis Zuni Bear hand carved, Sleeping Beauty Turquoise, only mined in Arizona, Malachite Heart, hand carved, Citrine, Carnelian, & Red Jade. At the bottom a Swarovski Crystal Drop. Sterling Silver for closure. 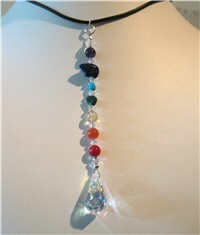 This Chakra Pendant includes the following gemstones. AAA Grade Quartz, A Grade Amethyst, Lapis Zuni Bear hand carved, Sleeping Beauty Turquoise, only mined in Arizona, Rose Quartz Heart, hand carved, Citrine, Carnelian, & Red Jade. At the bottom Is a Natural Beauty, a Rose Quartz Circle of love, hand carved, with Swarovski Crystal inside to let your love shine. Sterling Silver for closure. 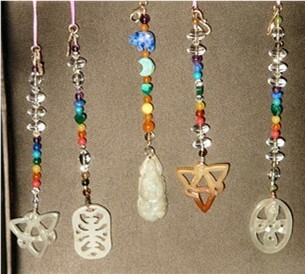 Here are some sample Chakra pendants you can special order. These all have hand carved jade symbols. Contact me if you need help with a description. All the gemstones are natural, with grade AAA Quartz, no glass. A brief list of the 7 chakras and the corresponding gemstones I like to use, depending on what I am creating, or depending on the wishes of the customer. My signature gemstones are hand carved Lapis Zuni Bear, hand carved Malachite or Rose Quartz heart, and Sleeping Beauty Turquoise. Sleeping Beauty Turquoise is only mined in Arizona. Every crystal and gemstone have their unique energy, I do the research for my customers to match what they are looking for than design beautiful healing wearable art.